Love the Gaither Vocal Band? The legendary, award-winning Gaither Vocal Band sheds new light on some of the most popular, timeless hymns of the church. From the hand-clappin "Love Lifted Me" and the transparent, heartfelt harmonies of 'Pass Me Not' to their easy-on-the-ear rendering of 'Redeemed' and the triumphant 'Amazing Grace' these straightforward classics combine the comfort of the familiar with moving vocal arrangements that are uniquely The Gaither Vocal Band. Bill Gaither, David Phelps, Wes Hampton, Mark Lowry and Michael English, along with producer Ben Isaacs, have created an intimate collection that is stirring and heartwarming. Hymns CD by Gaither Vocal Band was published by Gaither in November 2015 and is our 12998th best seller. The ISBN for Hymns CD is 0617884877729. 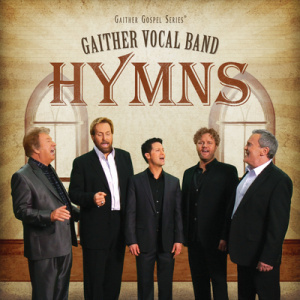 This is another beautiful album by the Gaither Vocal Band, bringing back memories of the 'old' hymns. Their harmonies are always amazing and their love for God shines through their voices and their faces. This is a very good CD with modern arrangement. The singing is good, now here's the 'but'. I'm very old-fashioned when it comes to hymns, I don't like them rearranged. rewritten, or 're' anything. For this reason I was disappointed. But, putting aside my prejudice, it is really good. Got a question? No problem! Just click here to ask us about Hymns CD. Now Playing: Amazing Grace Your browser does not support the audio element.